Commemorated at Thiepval Memorial, Somme, France. Memorial ref. : Pier and Face 10 C 10 D 11 A.
Horace was born in 1894 at Codnor Park, Derbyshire, son of Charles Wood Cartledge an iron works clerk & Isabella (nee Chambers). In 1901 the family was living in Laverick Road but by 1911 had moved to Dixie Street, Jacksdale. Horace was the youngest of six sons born to Isabella and Charles. His brothers were Henry, a clerk who went on to be an insurance agent, twins Reginald and Archibald and also Charles and Samuel. A newspaper article dated 7th May 1909, records the tragic death of Horace’s brother, Reginald, due to an accident at the Butterley Company Wagon Works, six weeks prior. The newspaper states that “he made such progress, that high hopes were entertained for his recovery but sadly Reginald lapsed into unconsciousness and due to his weakening state was unable to prepare himself for a further operation. Reginald was highly respected by all who knew him and the sad news caused ‘a widespread wave of sympathy’ in the district. His twin brother, Archie, was so overcome by the shock when he heard that his brother had passed away that he fell down in a faint, and had to be attended to by his work mates”. A tragic and sad reminder of the harsh and dangerous conditions endured by the working classes in the ‘battlefield’ of industry. Before joining up, Horace was a grocery assistant at the Underwood Co-Operative Stores. He enlisted at Eastwood, Notts, sometime prior to 1916 as he served with The Sherwoods during The Easter Rising in Dublin in 1916, when British Troops were drafted in to quell the Rebellion. On Friday 27th April 1917, only one year after his tour of duty in Ireland, Horace was killed in action during the attack at Hargicourt, France, aged 22. 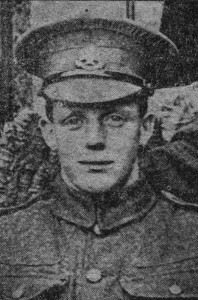 His friend, Private Harold Cheetham, serving in the same regiment and listed on the Jacksdale Memorial as having served, informed Horace’s parents that Horace had been shot through the temple and died instantaneously. 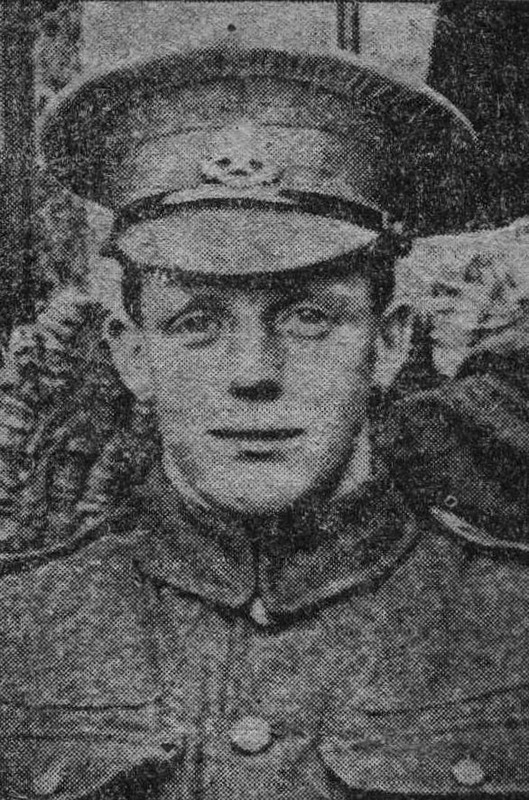 As a member of St Mary’s Church Choir, a Sunday School Teacher and a well known local footballer, Horace would, surely, have been well acquainted with 37412 Private Leslie Lemon, who shared common interests and was killed only a few days earlier on 9th April 1917, also aged 22. Horace was a recipient of the British War and Victory Medals. He is commemorated on the Thiepval Memorial, Somme, France, which bears the names of some 72, 000 officers and men who have no known grave. He is also listed on the Jacksdale Memorial, the Jacksdale Memorial Unveiling Roll of Honour and also, on more than one occasion, in the local press as ‘Cartledge’. 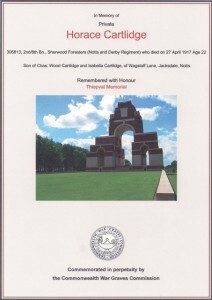 However, on the Commonwealth War Graves Site, in the Sherwood Foresters Roll, on his Medal Rolls Index Card, and on The Soldiers Died CD Horace’s surname is spelt ‘Cartlidge’. His father, Charles was a keen member of the Jacksdale Hospital Committee organising fund raising events in aid of local hospitals. His mother, Isabella, died in 1945 and is buried at Westwood, St. Mary’s.